Jehudo Meier Epstein was born into a poor family in Slonsk, Minsk, in the Russian Pale of Settlement. He received a thorough Jewish education, and in a memoir of 1929, ‘My Journey from East to West’, he particularly recalled the observance of the Jewish Holy Days in his childhood. He probably received his first drawing lessons in Vilnius, and studied at the Academy of Fine Arts, Vienna (1888-1894), where he won many prizes. 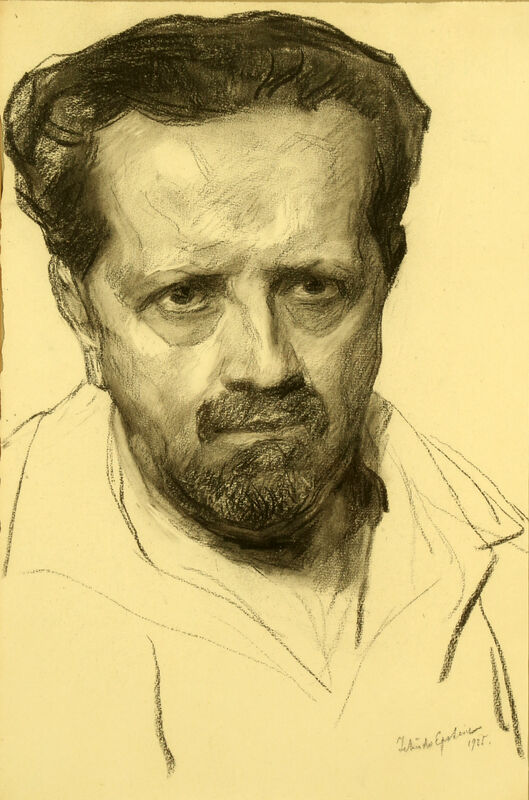 Epstein’s theme was eastern-European Jewish life, particularly figures from the Ghetto, as well as scenes from the Bible, landscapes and portraits. During the First World War he was an official Austrian war artist and in 1923 was made a Professor at the Vienna Academy. Following the Nazi rise to power, Epstein visited Cape Town, South Africa, to complete a commission in 1935; and immigrated to South Africa in either 1935 or 1938.After emigration, Epstein lived in Johannesburg with his wife, Gusti, in Gainsborough Mansions, Hillbrow (Berea), until his death on 16 November 1945. Epstein was cremated the following day in Johannesburg, but is buried in the Jewish section of the Viennese cemetery where his urn was transferred for burial by his widow on 18 October 1949.